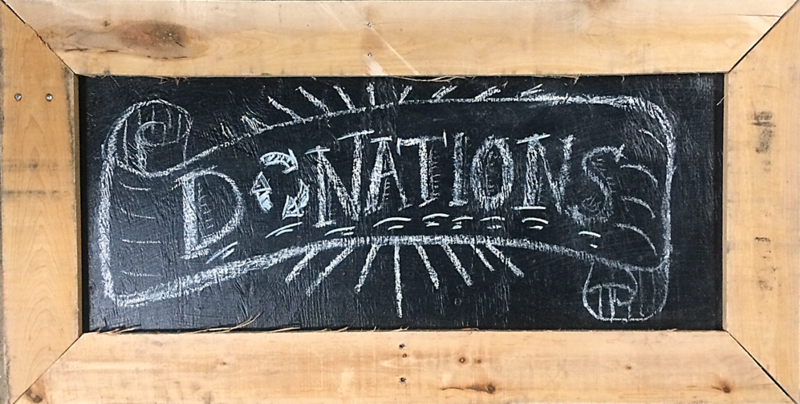 Community Forklift’s mission is to lift up local communities through sustainability and reuse. One way we do this is through our Community Building Blocks (CBB) program, which distributes free building materials to nonprofits, schools, volunteer groups, and others making a positive impact in the region. So far this year, we’ve awarded $59,228 in material grants to 78 organizations. 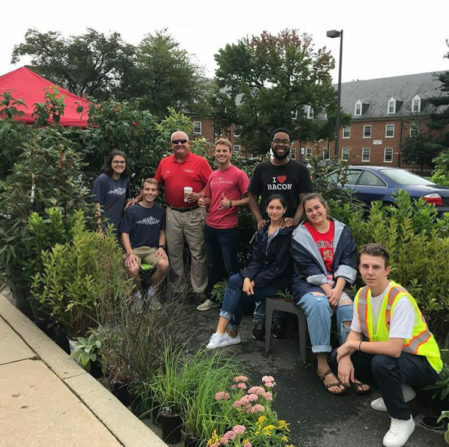 Because we’re just a few minutes from College Park, University of Maryland students often come to us for help with their service learning and volunteer projects. We hope you enjoy these photos and updates from two student groups who received CBB grants in 2018. Although they each needed only a small amount of materials, they both used their grants to push for big changes on campus! 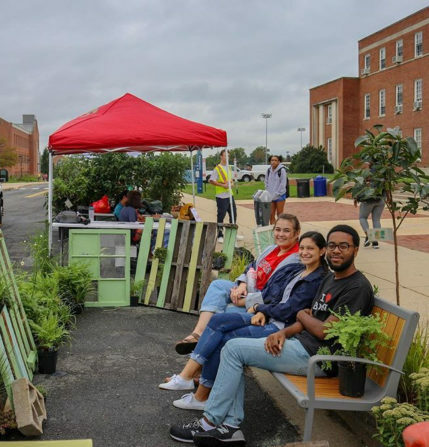 A group of students in the College Park Scholars Public Leadership Program organized a sustainable initiative on campus to promote proper waste disposal after noticing that students were disposing of their trash improperly. 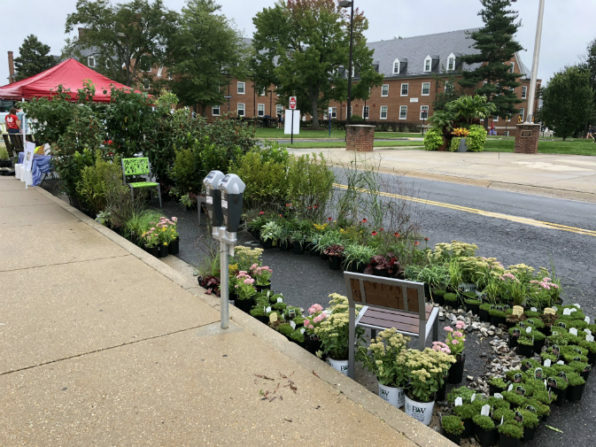 In 2017, UMD recycled just 51% of the waste it generated. 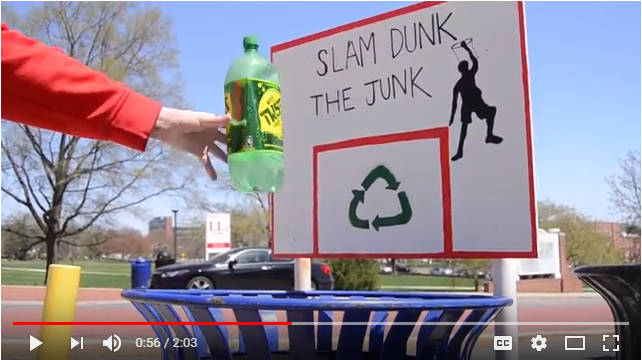 This shocking statistic gave UMD Scholars the motive to reach out to the Prince George’s Department of the Environment to participate in its Slam Dunk the Junk Campaign. They wanted to use gaming concepts to try to change student behavior – basically, the theory is that if you turn a boring activity into something fun and silly, more people will pay attention and participate. In this promotional video, UMD Men’s Basketball legend Andrew Terrell educates students on proper waste disposal habits. “Our idea is to assemble and attach basketball backboards to recycling bins and trash cans on campus. The backboards would list which materials could and could not be “dunked” into each basket. People, especially college students, are always drawn to opportunities for fun. We hope to capitalize on this fact by turning the mundane act of throwing away trash into an enjoyable game…We are committed to making a difference in our community and believe a grant from Community Forklift would greatly help our cause.” – student Noah L. Fortson, in his application for a CBB grant. In addition to the grant, our Outreach team gave the students a tour of the Forklift, and discussed which salvaged materials might work best for creating backboards. Their excitement was inspiring and we loved getting an update – their “celebrity spokesman” video is really fun! 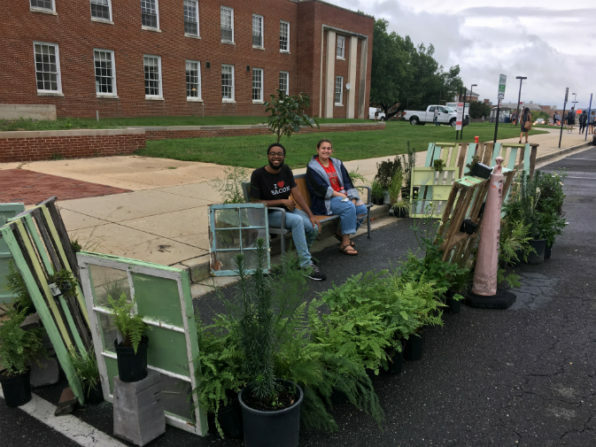 This past Friday, the Student Chapter of the American Society of Landscape Architecture (SASLA) celebrated PARK(ing) Day, an annual event that encourages community members, students and designers to transform metered parking spaces into temporary mini parks to advocate for green spaces and re-imagine how we use the built landscape. Check out these great photos – they created such a peaceful little space! Congratulations to the Senior Studio’s parklet “Succession” for winning this year’s design-build competition. They used paint and windows from Community Forklift in the design.